“SET STATISTICS IO” provides us very crucial information about the query we run, like scan count, logical read, physical read etc. but this command is really very ignored. While it’s coming to query optimization, many newbie or less experience person used to talk about DTA, profiler etc. but they JUST IGNORE simple yet powerful command “SET STATISTICS IO” whereas they first need to look at the information provided by “SET STATISTICS IO” so that you can move ahead and dig more details with the information provided by “SET STATISTICS IO”. We are going to create one database, named “SQLHub” and one table, named “Orders” under “SQLHub” database. “Orders” table would have approx 1,00,000 rows dynamically inserted. Now we are ready to see how query works. Let us create one simple “SELECT” T-SQL query with “SET STATICTICS IO”. --here is the stats info came via "SET STATISTICS ON" in "Message" tab. --Table 'orders'. Scan count 1, logical reads 409, physical reads 0, read-ahead reads 0, lob logical reads 0, lob physical reads 0, lob read-ahead reads 0. After running this query, you would get its results in result tab and some stats in “Message” tab, look at the screen capture. You can see “Logical Read 409”. 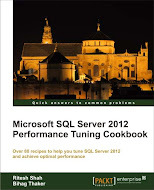 To find out all rows which has refno 23, SQL Server has to go for 409 pages internally. Now let us create an Index on RefNo column and see stats. After creating “Clustered Index” on “Orders” table for “refno” column, let us see the same query. --Table 'orders'. Scan count 1, logical reads 14, physical reads 0, read-ahead reads 0, lob logical reads 0, lob physical reads 0, lob read-ahead reads 0. You can see now “Logical Read 14” rather than “409”, you see how much difference clustered index have made? And you don’t need to go to profiler to see this difference, even no need for execution plan in this case. However I am not against the use of profiler and execution plan. They both are very intelligent and useful tools but just wanted to clear it up that; we can get important information from simple command like “SET STATISTICS IO” too. Apart from “Logical Read”, it provides you many more information in “Message” tab which you can see above like “Scan Count”, “Physical Read”, “Read-Ahead reads”, “log logical reads”, “lob physical reads” etc. you can get description of all these from Microsoft’s MSDN.